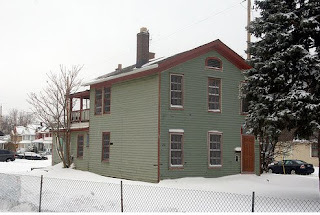 On November 10, 1814, when Noble Bates contracted with Aaron Olmsted to purchase the land this house would later stand on, the population of Cleveland was less than 600. In all of Cuyahoga County, there were fewer than 6,000 people. Noble Bates and Aurilla Boot Bates came to Newburgh Township from Essex, Vermont, in 1812. They had four daughters - two born in Vermont, and two in Ohio. Noble Bates livelihood was tied to their location adjacent to Mill Creek - he ran a mill, grinding grain into flour. (Pioneer Families of Cleveland, 1796-1840, page 141) He also operated a tavern in Newburg, the Bates Tavern, from at least 1820 - 1830. (Historic Sites of Cleveland, pages 61-62) Both the mill and tavern would have served as community gathering places and made Bates well familiar with the affairs of the area. Sophia Bates married Barnabas Laughton in 1830 and went to Chicago. Five years later, she returned a widow with two sons. Afterward she married Albert Kingsbury, and had one daughter. After Kingsbury's death, she married Thomas Garfield, uncle of the president, and another son was added to her children. Sophia Bates Garfield was energetic and jolly. Elvira Bates married Stephen V. R. Forbes of Chicago. Lucy Bates married Benjamin Wiggins of Newburgh, and had one daughter and two sons. Eunice Bates married Eben Miles, eldest son of Theodore and Lydia Clark Miles. She had two sons and two daughters. In 1835, Noble Bates sold most of Lot 472, excepting 28 acres from the southeast corner to Benjamin L. Wiggins, his son-in-law, for $1200. (AFN: 183510080009) Wiggins would have been familiar with the land, having grown up in such close proximity. Perhaps it was a wedding gift. Perhaps it was a way for Noble Bates to give his son-in-law some additional capital. The higher price-per-acre listed for the Bates - Wiggins transfer strongly suggests that it had been improved in some significant way - most likely by the construction of a house. On the same day it was given to them, Benjamin and Lucy Wiggins sold their part of Lot 472 to Zacharais Eddy for $2,000. (AFN: 183909160004) Eddy took out a mortgage with Noble Bates to pay for the property. This higher price is likely more indicitive of the property's true value, and suggests even more strongly that a house was already present. Sophia Bates and Thomas Garfield married on November 10, 1850. With this union, the land came back into the Bates family. Given Garfield's other land holdings, he probably already had a house. If there was one present, perhaps it was rented out. 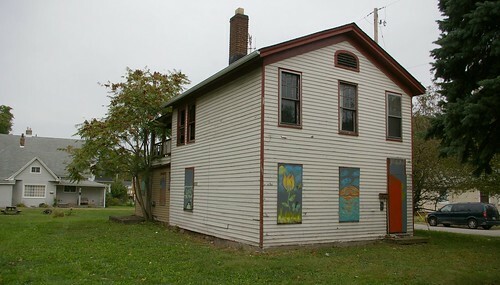 Alternately, the house may not have been standing at the time of the transfer to Thomas Garfield - perhaps the reason for the diminished value of the property. Sophia and Thomas Garfield are said to have resided in this house, built c. 1850, at 4400 Turney Road. (Recollections: A Collection of Histories and Memories of Garfield Heights, page 10) The book also provides a historic photo - I detailed this subject, and the time that their nephew, James A. Garfield, spent with them back in June. In the spring of 1854, for the sum of $213, the Garfields sold .6 acres to one H.M. Miller. (AFN: 185403230004) The next month, Miller took out a mortgage with Garfield to pay for the lot. 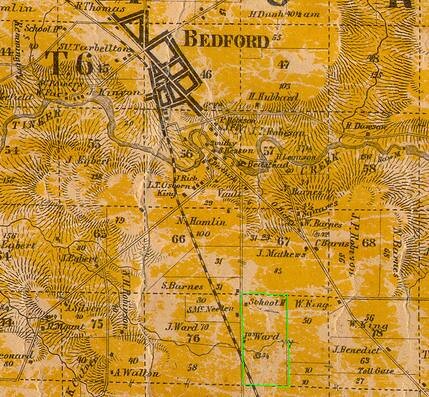 (AFNL 185404140009) The property would have been in the northeast corner of the section outlined here. This was the first time the parcel the house sits upon was clearly separated from the larger lot. It seems reasonable to suspect that the house may have been built by H.M. (or H.W.) Miller, an individual for whom, unfortunately, I have been unable to learn anything else. Miller does not show up on the 1850, 1860, or 1870 U.S. Census for the are. Further, I have been unable to locate when Miller might have sold the house to the next owners, the Browns. In 1855, the Cleveland State Hospital was completed, on the opposite side of the road. It was built on land donated by the Garfield family. James H. Brown and Elizabeth Brown were both born in England, in about 1820 and 1823, respectively. They emigrated to Canada, where they had a child, Louisa, in 1860. (1870 U.S. Census) Sometime before 1870, they moved to Newburgh. James H. Brown was a carpenter and joiner. It's possible that he built the house, if the property was transferred to him relatively shortly after Miller became owner of it. It's also possible that he did a major renovation on the existing structure. Regardless of the builder, the house is indicative of a moment of social change. This is not the sort of house that we expect to find on a farm. Rather, it is indicative of a house built in town. In the 1850s, the area in the center of Newburg was built up, and there were plenty of houses along Warner Road, but Turney remained less densely populated. In the following decades, this would change. 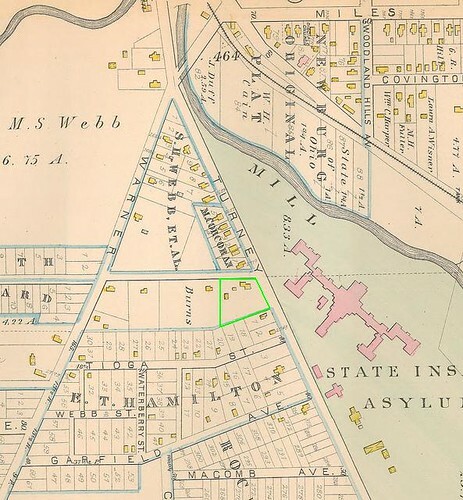 In 1873, this part of Newburgh Township was annexed by the city of Cleveland. This confirms the growing economic importance of the industry located along Mill Creek. The Browns sold this .75 acre parcel to Carrie L. Salisbury, wife of Vial Salisbury in April, 1874, for $3,800. The Salisburys moved here from Bedford. (AFN: 187404040019) By this time, Thomas Garfield's farm had been split up into residential parcels. Two years prior, this building was completed. 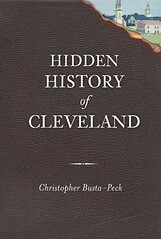 It was part of the massive new complex for Cleveland State Hospital, on the east side of Turney Road. Ot was built by John Gill and Sons, whom you might remember from this Euclid Avenue house. The Victorian stone edifice would loom over the neighborhood for the next hundred years. Caroline Ward was born in Pennsylvania, in about 1845, to Joseph and Emeline Wood. 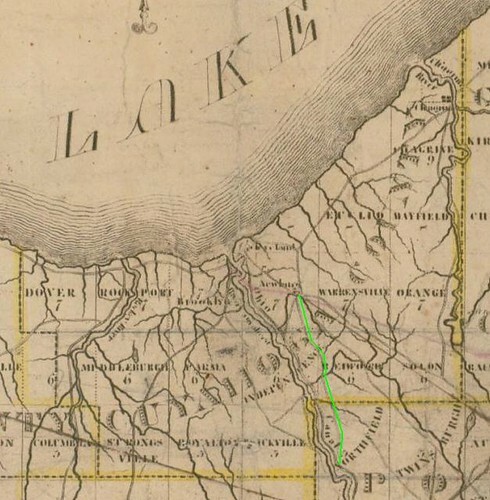 A few years later, the family moved to Bedford township, where they purchased a farm of about 83 acres, located south of the village, shown here in the 1858 Hopkins Map of Cuyahoga County. 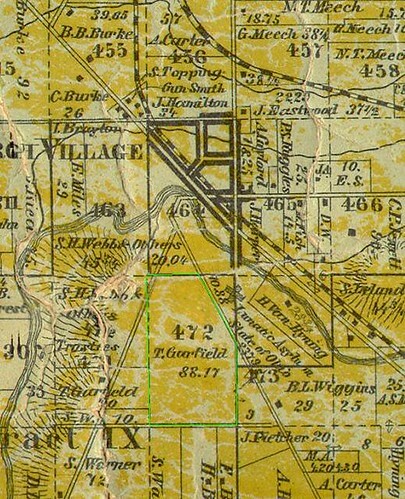 Their farm, on what is now Northfield Road (State Route 8), was transversed shortly after their purchase by the Cleveland and Pittsburgh Railroad. A tributary to Tinker's Creek ran through the property. The schoolhouse was just down the road, to the north. 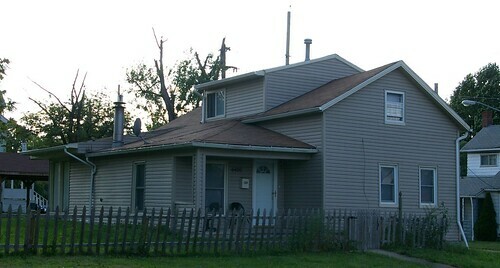 The farmhouse was located near the intersection with Forbes Road. Shortly after his return to Ohio, Vial Salisbury and Carrie Ward were married. They had four children: William (born 1866); Alson (born 1869); Joseph (born 1876); and Emma (born 1878). Also was born in Pennsylvania, suggesting that they had resided there for a time before returning to Ohio. Vial would work for the State Hospital. This Annual Report indicates that he worked for four months of 1876 as a painter, earning $100. He remained in its employment of the for the rest of the following year, 1877, as a painter, with an annual salary of $300. We can probably assume that he remained their employee for several years following. 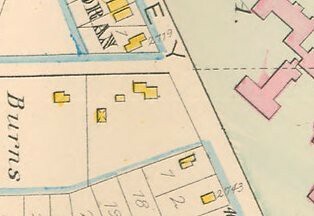 This detail, from the 1881 City Atlas of Cleveland, Ohio illustrates the location of the parcel in question. This is the full size of the parcel sold by Thomas Garfield to H.M. Miller, before any parts were sold off. It illustrates the growth of the residential areas around the house, as well as the massive campus of the State Hospital. Compare this to the 1858 map, above, where this area was almost entirely farmland. This is a closer detail of the same location. It shows that the farmhouse had reached the current shape, with a minor exceptions, by 1881. Further, the property is shown to contain a barn of a decent size - perhaps 700 square feet - and a small shed. The Salisburys witnessed the growth of this area to one that was more densely populated and that focused more heavily on industry. In 1894, the Salisburys sold off the west end of lot for $250. (AFN 189402030016) This diminishment of the lot marked another transition point in this property, to one with a still less rural note. The exact date of Vial Salisbury's death is unknown. It was between 1894 and 1903, and probably before 1900, but beyond that, evidence is lacking. Lorenzo F. McGrath, Cleveland. Beckwith & McGrath. Born Big Island Township, Marion Co., Ohio, Nov. 28, 1871. Teacher in public schools from 1888 to 1891. Admitted to the Bar June, 1894. Began the practice of law in Cleveland same year and later in the firm of McGrath & Stern. Assisted in the organization of and became interested in several coal and railroad enterprises in West Virginia. President of Cleveland & West Virginia Coal Co.; Director The Cecil Coal & Coke Co.; Director The Valley Fork Coal Co.; Director The S. W. Burrows Co.; Vice-President The West Virginia Securities Co.; Member the Cleveland Chamber of Commerce; Member Clifton Club. August J. Flueck was born in about 1862 in Ohio, the son of German immigrants. He married Catherine J. Schmitt, who was born in about 1865, also the child of German immigrants. (1910 U.S. Census) They had three daughters: Frances M., born in about 1897; Catherine A., born in about 1901; and Alexandra T., born in about 1906. (AFN: 194609070013) The house would remain in one of their hands for almost 70 years. August Flueck was a machinist in the steel mills. As of 1910, 4340 Turney was being rented by two families. Perhaps it had been split up into a duplex. One was that of Gustav W. C. Trende, a wire drawer in a wire mill, and Katherine Trende. At the time, they had five children: Arthur (17); Nicholas (16); Frank A. (14); Florence (12); Carl M. (3); and Walter J. (9/12). Two were employed in industry - Arthur as a teamster and Nicholas as a plater in a chain works. The other family living at 4340 Turney in 1910 was that of Gregory Gonder, Theresa Gonder, and their son, Martin G. Gonder. Martin was employed as a machinist in the chain works, and his father, as a helper there. These occupations all indicate the industrial trend the neighborhood had taken. The air was surely hazey with pollution. The date of of August Flueck's death is unknown, however, by 1920, Catherine Flueck is listed as a widow. Perhaps the cause of death was an industrial accident. All three daughters were still living with her. Frances and Catherine A. were both working as stenographers, in a hardware store and chair factory, respectively. Charles (23); John (19); Fred (17); Myrtle (14); George (12); Gladys (8); and Lucille (3). Charles worked as a machinist in a steel mill, while John and Fred both were employed in a print shop. I have been unable to locate the 1930 U.S. Census records for the Fluecks or for the residents of 4340 Turney. When found, they will surely illuminate the state of the neighborhood at that time. The Bennet family had left the house by this time, for a residence on East 95th Street. The State Hospital was closed in the early 1970s, and the main building was demolished soon after. The site of the State Hospital was redeveloped, and in the late 1990s, new homes were built there. How old, then, is the house itself? It's a difficult question. The evidence presented above would tend toward a date after 1854. A house would not have been built in this style after the Civil War, and there was virtually no construction during the Civil War, so 1861 is a reasonable end date. The stone used for the foundation is so abraded that we can't really tell much about the age of the house from whatever tooling might have been present on it at one point. Further, the wood siding was replaced at some point in the past. In doing so, some trim detail may have been lost. Said detail might have suggested an earlier date. Finally, the house shows evidence of having been framed with boards cut on a sawmill. The front door may reveal more of the story. 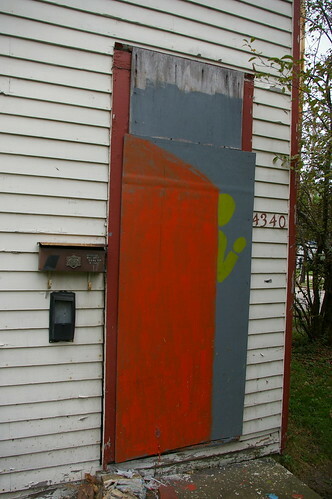 The door is probably about 6'8" - the height of a standard door today. 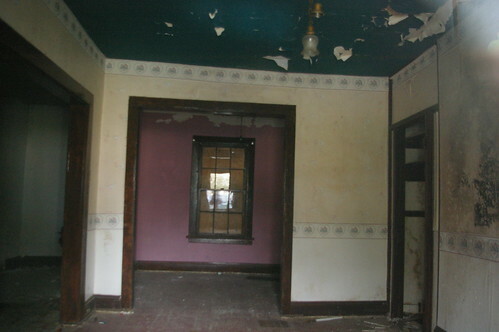 Above the doorframe is a transom - a window, probably 3 or 4 panes. The style of this tends toward the 1850s, but could have been present at an earlier date as well. The framing of the front door raises questions. Note that while the lumber appears to have saw marks, it also seems to have been worked by hand quite a bit. While it is reasonably likely that this house was built in the 1850s, there's another option that cannot be ignored. When the property changed hands in the 1830s, the price suggested a major improvement to the property, as noted above. Yet when Garfield sold the small lot to Miller in 1854, the price was less than what one might expect for a lot with a solid dwelling. Perhaps the dwelling in question was elsewhere on the property. I have another idea. Perhaps the condition of the dwelling had deteriorated significantly. It could have been used as a rental property - it was at the opposite end of the parcel from Garfield's residence. Rather than deal with a decaying house that he didn't need, Garfield might have sold off the land. Miller might have fixed up the house, or James H. Brown, an enterprising carpenter, might have significantly renovated and expanded the existing structure. Either way, this structure is an important piece of our past. I can't think of similar structure in this city outside of Ohio City and Tremont. This house is at least 150 years old. It has survived through the transition of this neighborhood from rural to urban. It has endured the rise and fall of industry. Yet now the owner wants to demolish it and be rid of this liability. 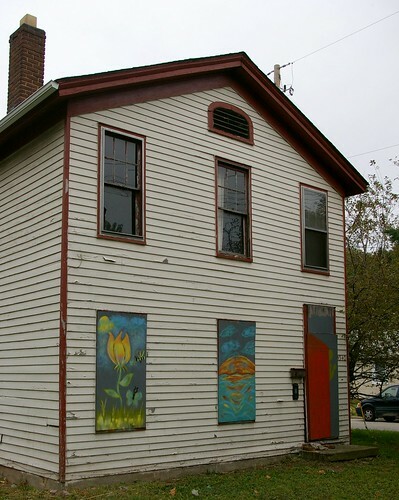 The owner, one Willie F. Hodges, has pulled a demolition permit for the property. As the house is not in a landmark district, he could proceed forward with this at any time. I sincerely hope that he reconsiders. Yes, this house does need some work. But it's not an insurmountable project. The interior, from what I could see, isn't especially scary. The historic details that remain are relatively easy to work with. Take a look at this illustration by Shawn Hoefler, from back in March, when I first mentioned it. Imagine it in white, with dark green shutters on the windows - the proportions are such that there were likely shutters there originally. Further, imagine it with a small garage to the rear, done in red, and shaped like a small barn. It could happen. The house has great proportions. It appears to retain most of the original double-hung windows. The biggest thing now, other than removing the boards from the windows, to improve the aesthetics would be to prune the trees / bushes in front of the house. This would do much to improve its street presence. This neighborhood has a lot going for it. There's Mill Creek Falls, the highest waterfall in Cuyahoga County, and the associated parks serving it. There's a ton of great architecture along Miles Avenue, Turney Road, and Warner Road. Those, however, are the subject of another post - I trust that you don't want me to ramble on for another 1500 words. This is the sort of house that neighborhoods are rebuilt around. If Mr. Hodges is unable to manage the task of restoring it, I can respect that. But he needs to step aside, then, and offer it to someone who can. It's a piece of history that we simply cannot afford to lose. Notice that Hodges owes $31,596.07 in back taxes and fines. How can the city allow him to demolish a structure in which he owes so much money. The city should take the property over and offer it up in a sherrifs auction. My understanding is that it was offered up at sheriff's sale and that there were no takers. Your research and concern are remarkable. This is in my old neighborhood (1950-1975) where my family owned properties back into the 19th century. Keep up the good and heroic work. Unfortunate...if it is to be torn down, it is hoped that someone will salvage the windows and the pieces and parts...that is what I do here in Summit Co. and nearby counties...it is a shame...they tore down 1840 houses in downtown Akron in the last 5 years and the city refused to let anyone salvage a door knob...even when we tried to embarass them into it in the Beacon Journal...your research is unbelievable!!! Wonderfully documented example of all the history that lies behind us and is constantly swept into the dustbin of momentary convenience. Anonymous, posting October 1, what are you going to do about it? Incredible research and time put into this. Your passion is contagious. At this point I am not competent to do anything more than just learn from you. Thank you for all you do. Now you have me looking and thinking everywhere I go. I agree with Linda. Thank you for so much effort in saving these pieces of history and fighting for Cleveland. I happened upon this blog while attempting to find the name of the architect for the Cleveland State Hospital. I grew up on Ella Avenue, one house from Turney Road, from 1966 to 1983. In the shadow of the two massive Victorian towers of the hospital. I have walked by the houses you described many, many times on my way to and from Trinity High School in the 1980s. I was so very stunned to read your meticulously researched and vibrantly written history of this area. I had a cursory knowledge of the area but had never come across this depth of detail. I thank you for enlightening me and giving me the desire to learn more.